Crashes every time I open the new version. Has worked fine before. Really low latency, undetectable to me. Great import export options. Easy to use. Definitely best looper available. I hesitated to get this one - I'm a sucker for music apps, have a ton already - so I thought I didn't need this. However, needed a better output slot device for Audiobus so went ahead and... ...WHOA. Tip notch tutorial, well planned functionality in every aspect, powerful yet easy enough for my 3 year old to use (!). When you come up with an idea for a song or a part and don't want to fire up the DAW, this is perfect. My one feature request would be some kind of simple wav editing, for loops which need a couple seconds of silence at the beginning or end chopped off. So many bugs and stuff i would love a refund. Please. Just filled my night with music and inspiration. I wrote A song in about half an hour with this app already. Most fun on iPhone ever. For a while now, I've been using the native Voice Memo app to record guitar parts (more for book keeping, then anything). To get anything with more then one guitar track, I'd have to use a traditional loop pedal setup, and record the playback. With loopy, I now have a functioning loop station tucked away in my pocket, ready for use at a moments notice. I can't begin to express how much of a luxury this app is to have. The interface is by no means intuitive, but after getting used to it, Loopy becomes a quintessential recording tool. This is by far the best investment you can get for the price of a cup of coffee. Every update brings a bunch of unnecessary changes. I have no idea how to use this app anymore. The "wheel" to change tempo is almost unusable. Please fix. Fantastic tool for creating loops on the fly! And I love it! All this time, I didn't realize that what I really needed was a looper. I keep trying to make these songs, but all I have in my head are clips. Loopy lets me put them together, run them side by side and cut them in and out as I want. I live this little app. I don't really know what the difference is between Loopy and Loopy HD, but regular Loopy is working fine for me. Turned it on and it took over my phone. Could not turn off, lower volume...anything. I'm outta here. Love loopy. Recommend it to my musician friends. For me the best part is hearing how different loops combine together. It's fun to tinker with it at leisure...without recording. Wish I could share a whole session with all my pan/volume settings with fellow loopy users so they can tinker with my polished session. I've never actually used a looper before, but I was looking into buying one and they're $100+, so being able to get one on my iPhone for $3 is great! 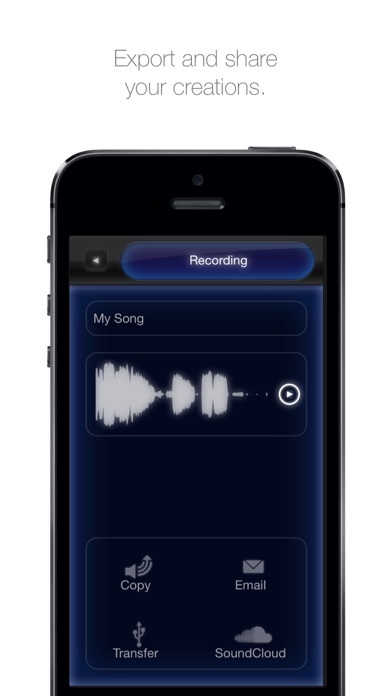 I'm not sure you can hook up a higher quality mic (because the built in one is awful) but this app is perfect for getting song ideas down and just having fun. If I wanted to make anything into a more professional song I could use this as my guide and hash out the midi notes. Once you get used to it it's actually very intuitive and easy to control. I've never reviewed anything before either, I just felt this did a really great job and had to write one up! This is a really fun app for the amateur beatboxer. Is really easy to use. Only problem I find is that you need headphones or else the tracks will pick up static. But other than that its fantastic. Installed on an iPod Touch 4G with iOS 5. App won't get past the loading screen. This program was great until I got the second to last most recent iOS 7 update. That update ruined many of my favorite apps. This often happens with the updates. I will hold off from updating my operating system as long as humanly possible from now on. I'm sick of this BS. This app has been very useful for me to develop ideas for my jazz compositions. It easily records up to 6 tracks from my Mac earphones (with built-in microphone), and has many helpful features, like instant "retakes" and volume control on each track. A very useful app, it's amazing what transpires when you can throw all sorts of loops together and have them all play in sync. 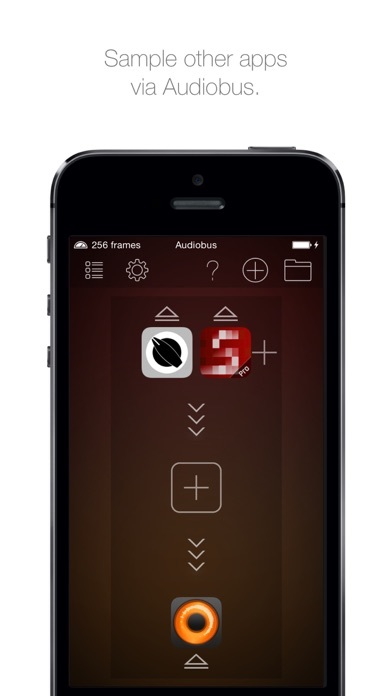 Audiobus support makes this purchase a no brainer. Quite simply the best dollar/performance, app, there is. Hey…have to say…super productive experimental tool. Way to go!!!! This app is excellent at doing it's job, and I have no problems with crashing or freezing. I do wish there was a way to queue tracks to play one after another rather than tapping on one that's playing and one that's muted. Sometimes, I can't tap right on the beat, but if I could just queue them to go in a specific order, it'd save a ton of hassle. Great app, keep the updates coming. 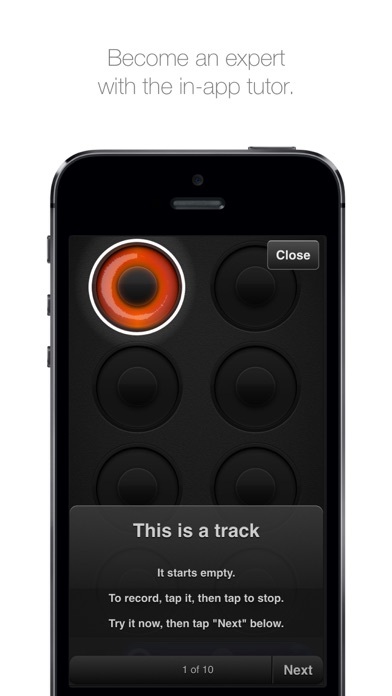 This app is one of my favorites for making music. Once you figure out how to manage looping and keeping everything in sync, it is very easy to operate. There are so many options and possibilities. 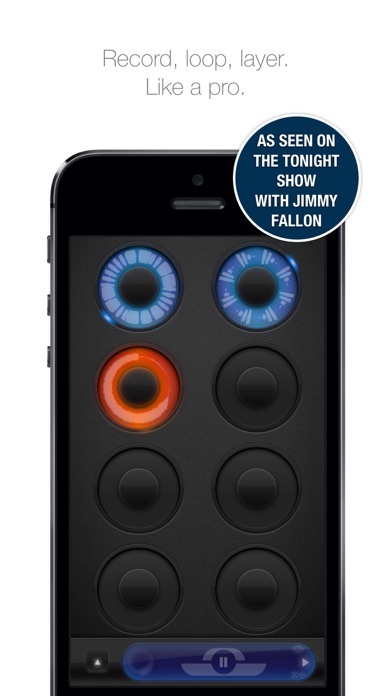 Great for building songs on the couch and powerful enough to use as a looper on-stage. Thanks very much for the great work, really great tool. I would also try to create a more responsive swipe function to get to re-record menu, maybe long press is better? Loopy is one of only two apps I've ever paid for, and that's because it's an incredible, intuitive and always surprising. If you are at all interested in sound recording, loops, electronic music, sampling, Steve Reich, experimentation, getting the most out of life, and musique concrete, Lappy is the app you're missing that you gotta grab up. Using it with the iVCS3 is 60's electronic bliss. 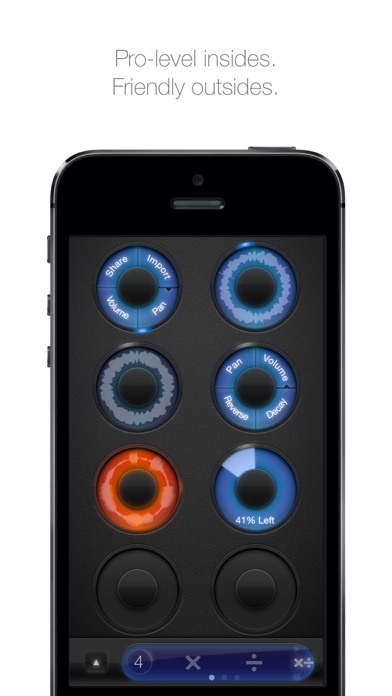 Works flawlessly and clock syncs to the universal iOS DAW BeatMaker 2! By far. And one of the best loopers on any platform. Just get it. Pro tip: If you have an iPad (or might one day) splurge on the HD version. I love Reggie's style so I was looking for a looping program, this is the closest and the most easy equipment to have without dropping hundreds. It is intuitive but also fun to use. Totally recommended! One Thing Left to Do! I love this app, I have had if for a few years now and this app is absolutely perfect. ALL, you have to do now, is add a video recording option with all of the same capabilities as the audio recording one, and you would have completely DESTROYED the mess that is the Acapella App by PicPlayPost. Please do this!!!! Would be awesome except the long cross fade time when changing loops makes this unusable for drum loops in a live set due to the split second gap in sound. What are you doing reading these reviews when you could be buying this app? Money was worth it! Only thing they need now is effects..
Has great potential. Simple & Easy to use! The only thing keeping this app from a 5 out of 5 is the absence of iCloud Sync! AND there's no rendering option(s)! The only way to finalize you're finished work for exporting is by hitting the record button on the menu screen, switching over to the track board screen, hit play, wait for the entire piece to play — hope for complete silence around you because it captures all outside noise, and finally, hit record once more — before it loops over again — to end recording. Your final result, a hissy-mono version of your work. Because it ends up being monophonic, outside of the app itself, the panning feature is rendered useless. These are big problems with simple solutions to an otherwise flawless app. This is a really fun app that has the ability to get ideas flowing that you'd probably never dream up on your own. Great tool.